The fire was discovered at 9:40 p.m. by Bernard Clark of Bentonsport who was driving home from Bonaparte. As he turned into Goff's driveway, a neighbor across the street, Mrs. Willie Stout, saw his tail lights and called her husband. Clark and Stout and another neighbor, Frank Hackard, were the first on the scene. Clark kicked the door in but the men were unable to enter because of the dense smoke. Stout said when the door was kicked open there was a sort of a booming sound and the flames shot up. Stout turned the valve off on a full tank of oil located on the west side of the house. The fire alarm was turned in by Roy Thomas who lives south of the Stouts. Cause of the blaze is not known. Sheriff Lee said Goff may have been having trouble with his oil heater trouble with his oil heater used to heat the house. Goff was a bachelor and lived alone. He reportedly had complained of having dizzy spells. The house was wired for electricity but Goff didn't use it; he told neighbors he preferred his kerosene lamp because electric lights bothered his eyes. 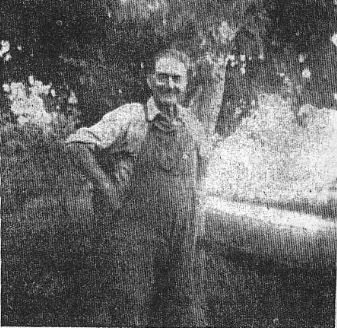 He was a resident of Bentonsport for more than 20 years and formerly was caretaker of the Vernon and Bentonsport cemeteries. Goff was a World War I veteran and had returned from the Veterans Hospital at Iowa City two months ago. He told his neighbors he wanted to stay there but they wouldn't keep him because he wasn't a bed patient. When he was dismissed from the hospital he entered the Becker Nursing Home in Bonaparte but didn't stay because he found it too costly. He lived on his veterans pension and had refused to apply for old age pension. he was well liked by his neighbors who said he kept his yard as neat as a pin. He smoked a pipe and raised his own tobacco in the back yard. Andrew Walter Goff, 73, of Bentonsport was burned to death Saturday night when fire destroyed his 2-room frame house in the northeast corner of Bentonsport, a small Van Buren County ghost town located 4 miles west of Bonaparte. Bonaparte and Keosauqua firemen were at the scene for about four hours in 8 degree below zero temperatures. When the Bonaparte firemen arrived at 10 p.m. the house was too far gone to save. Firemen probing with rakes found the body under the brick of the flue at about 1:30 a.m. Van Buren County Sheriff Orville Lee said Goff apparently fell asleep in a chair. The body was burned beyond recognition. The wooden rocking chair was always at the foot of the bed which was about in the middle of the house next to the kitchen door.